Another day, another major escalation of tensions caused by US actions. The recent downing of a Syrian jet by a US F-18 Super Hornet, is just the latest instalment in a series of US provocations in Syria since Donald Trump took office in January. The ‘non-interventionist’ Commander-in-Chief has continued and expanded the wars launched by previous US leaders, as Trump has essentially given the military carte blanche to do whatever it wants. From using white phosphorus in Iraq and Syria, to sendingthousands more troops into Afghanistan, the US military machine remains completely out of control. But why did an American fighter jet shoot down a Syrian warplane? Whilst the US – which is operating illegally in Syria – justified the action by saying that the Syrian jet was targeting US-backed forces on the ground (in the form of the Kurdish-led Syrian Democratic Forces (SDF)), the Syrian government said that the jet was on a mission against ISIS militants (who were created thanks to US-backing). “What is it then, if not an act of aggression, an act directly in breach of international law. If you want, it’s actually help for the terrorists the US is fighting, declaring that they are conducting a counterterrorism policy. As tensions ratchet up to new levels, Russia has warned the US that they are now tracking US-led coalition jets that fly west of the Euphrates river as potential targets. Baiting Russia into a Military Response? Although the official US narrative was that they were protecting US-backed forces on the ground, one cannot help but question the justification used by a country that has repeatedly lied and deceived in order to launch imperial wars. There is a very real danger that the decision to shoot down a Syrian jet was designed to provoke Syria to respond militarily to US forces, therefore providing justification for a full-scale invasion of Syria by the US and her allies. Moreover, and more dangerously, there is a potential that this incident was designed (by rogue elements with the US) to provoke Russia to respond militarily to the US in Syria, providing justification to start a hot war with Russia, and launch a pre-emptive nuclear attack on Russia. Although this may sound like madness, we should not underestimate how mad the neocons are. The US and Russia have reportedly already come extremely close to a direct confrontation in Syria earlier this year. In April, after the US launched 59 Tomahawk cruise missiles at a Syrian airfield, Russia was “an inch from confrontation” with the US, according to the Iranian President, Hassan Rouhani. Any followers of Dr. Paul Craig Roberts work, the former Assistant Secretary of the Treasury for Economic Policy, who also worked at a variety of US think tanks in Washington, will know that he has repeatedly warned that some belligerent and crazed elements within Washington are actually considering launching a pre-emptive nuclear strike on Russia. 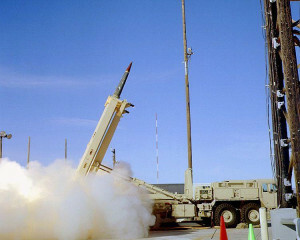 US anti-ballistic missile systems in eastern Europe and in other regions cannot only be used to try and intercept any retaliatory Russian nuclear missiles fired toward NATO countries in response to a US pre-emptive nuclear strike, but, as Vladimir Putin has repeatedly warned, many of these ‘defensive’ systems can be quickly turned into offensive systems, used to launch nuclear missiles at Russia in a sneak attack. This is part of the reason why Russian officials have repeatedly called the US anti-missile shield a threat, with Romania hosting a $800m section of the shield. Before any war, the state always embarks on an outlandish campaign to demonize the target in the eyes of the people. One logical conclusion to be drawn from the incessant array of anti-Russian propaganda that has been promulgated by the West in recent years, is that it is designed toinculcate in the minds of the western public that Russia is the enemy, in preparation for a future war. In recent years, the world has become increasingly more unstable. Tensions between Russia and the US have reached a level not seen since the height of the Cold War, with some even arguing that we have surpassed this point by now. The US is continually provoking Russia, as the hawks in Washington cannot stand the fact that Moscow has stood up to the neocons in Syria. Perhaps the US is trying to intimidate Russia so that it backs down, but this is a very dangerous game to play. How many times can the US poke the Russian bear before the bear responds? Very few know the answer to this question, but the central point is that the US must stop asking this question in the first place. The world stands on the edge of a dangerous precipice, as it slides towards war.